Blanket measures approx. 48" x 48"
Of course, that latest voicemail you got was a message straight from Captain America himself. He says he wants to get your whole family involved in some superhero fun. And that means we just need to get your kids suited up as a real deal hero. Got any ideas in mind? We actually think they should suit up as Captain America himself. And we've got an easy way to do it. 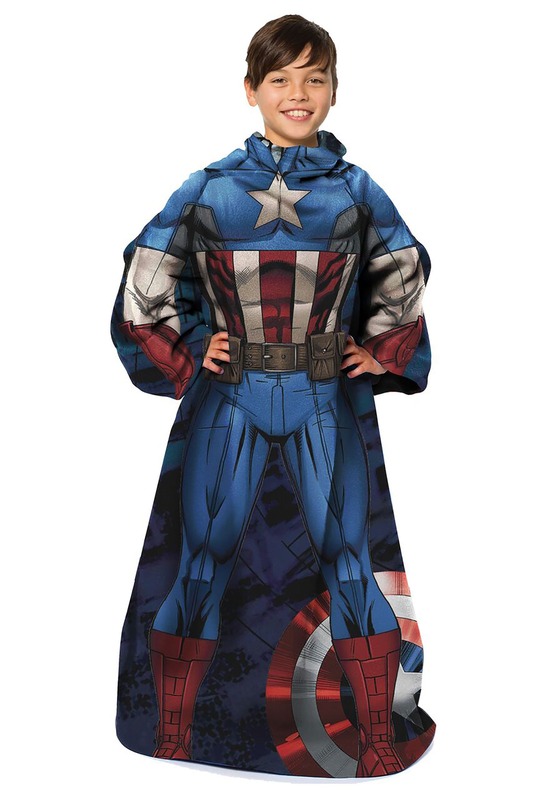 They've just got to slip on this Captain America Kid's Comfy Throw! Marvel Comics officially licensed, this Comfy Throw is a blanket that features sleeves for the perfect blanket fit. It's made of super soft 100 percent polyester fleece, and it's printed with Captain America costume details on the outer. It measures about 48" by 48" and is machine washable. We've got lots of costumes, that's for sure, but we're about costume fun all the time! So that most definitely includes movie night. Have your kid cuddle up in this Comfy Throw the next time you watch an Avengers movie, and the fun is sure to be extra awesome!